This fascinating festival for devotees of 'Sak Yant' or magic tattoos is held each year in March at Wat Bang Phra in Nakhon Pathom Province, just outside of Bangkok. 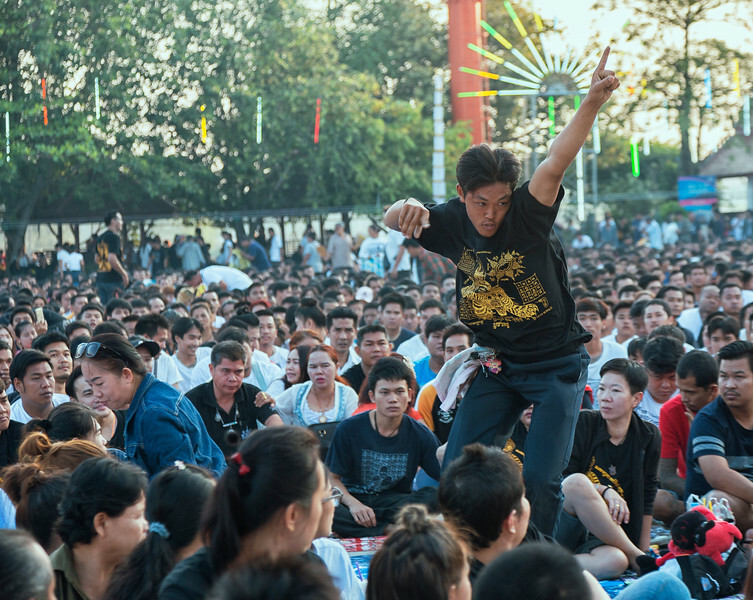 Enthusiasts get new tattoos on Friday night preceding the main festival day on Saturday, and get them 'charged up' with magic mojo by paying homage('Wai Kru') to famous monks on Saturday morning. As the festival carries on, sak yant devotees, many covered in traditional hand-poked tattoos, become entranced, speaking in tongues, imitating the animals depicted in their ink, and running at full speed down the aisles of onlookers. They are caught by waiting soldiers, other devotees, and paramedics who try to keep them from injuring themselves in a fall or collision. Many of these Sak Yant devotees truly believe that their magic tattoos will protect them from grievous bodily harm, even making them knife or bulletproof. Beliefs based in animism in Thailand are often just as pervasive as Buddhist faith, and this festival of thousands of believers is a testament these convictions.